It is a constant. The familiar value is 3.14159. It is irrational – it cannot be written as a fraction using 2 integers, although, some approximations, like 22 / 7, are used. It is transcendental – this means there is no algebraic equation for which it is the solution (algebraic equations look like this: x2 – 2 = 0 or x2 – x – 1 = 0 or 8x3 – 3 = 0), or, as Euler is claimed to have said, “They transcend algebra”. The relationship between the circumference of a circle and its diameter has been known for thousands of years. The Babylonians knew it, as did the ancient Egyptians and the ancient Greeks – although, it wasn’t called Pi back then. The symbol π and the name Pi were introduced William Jones in 1706 – previously, it was always referred to as “the ratio between the circumference of a circle to its diameter”. The symbol π is taken from the first letter of the Greek word perimetros (περιμετρος) – for the perimeter (or circumference) of a circle (circumference comes from a Latin root, whereas perimeter comes from a Greek root). Had Julius Caesar not managed to burn down the Library of Alexandria in 48BCE, our knowledge of ancient history, culture, mathematics and science would likely be more complete. As it stands, our knowledge is fragmentary, but it is pretty obvious that the ancients were curious about the world around them and sought to understand it (just as people do today). 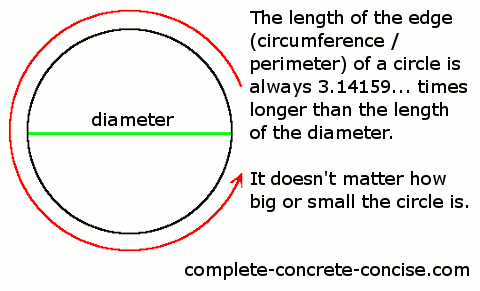 One of the things they discovered was that the length of the edge of a circle (its circumference or perimeter) was always a little more than 3 times the length of the diameter of the circle. The ancient Egyptians estimated it at 256 / 81 (written in some texts as 4 x (8 / 9)2). Archimedes narrowed down the value to being somewhere between 3 + 10 / 71 and 3 + 1 / 7 (or 223 / 71 and 22 / 7). It doesn’t matter how big or small the circle is, the length of the edge is always 3.14159… times longer than its diameter. The ratio of the circumference to the diameter is not the only relationship we can find in a circle. There is also the ratio of the circumference to the radius (which leads to the concept of the radian) and the ratio of the diameter to the radius. Get a round cardboard tube (one that is reasonably round and not squished too much – a toilet paper roll is fine). Measure the diameter of the tube using a ruler (it’s a good idea to take several different measurements across the tube and average them out). Cut the tube lengthwise with a pair of scissors. Lay the cut tube flat and measure the width. Divide the width of the flat tube by the diameter of the tube. 118.4 / 38.0 = 3.116 – a reasonably close empirical value for Pi. Get something round (a tin can, a plastic tub, a CD, a roll of tape). Measure the diameter of the object. Make a small mark on the edge of the object. Put the object, mark down, on a sheet of paper. Mark the position on the paper. Mark that position on the paper. Divide the distance between the two marks (which is equal to the length of the edge of the round object) by the diameter of the object. 376.8 / 120 = 3.14 – I think I was just lucky to have rolled out the CD so accurately). Using a sharp knife, cut through several layers of the tape (at least two). Pull off a strip of tape (since the tape is cut, you will only be able to pull off a length equal to the circumference of the roll – well, the first strip might be shorter, so discard it). Carefully stick the strip to a piece of paper. Measure the length of the strip. Divide the length of the strip by the diameter of the roll. 401.5 / 127.8 = 3.144 – another very close empirical measurement. If you have a tape measure (not the metal kind), then you can wrap the tape measure around the circumference of the round object and measure the length of the edge that way.